The government has failed in its bid to stop the Court of Justice of the European Union (CJEU) hearing a case on whether the UK can unilaterally revoke its Article 50 request to leave the EU. 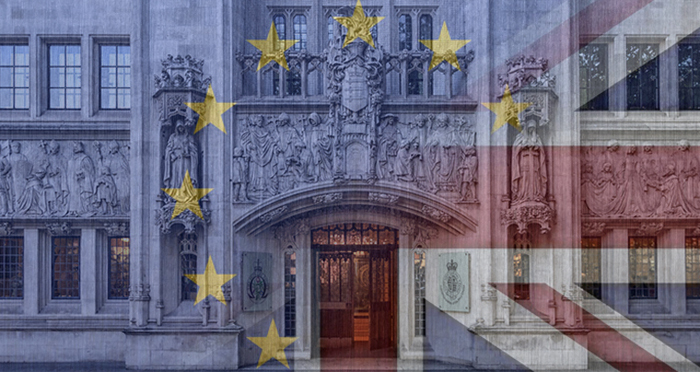 The Supreme Court this morning rejected the government’s application for permission to appeal in the matter of the Secretary of State for Exiting the European Union v Wightman and others. The case, which was brought by six Scottish MPs, MEPs and MSPs, along with Devereux Chambers‘ Jolyon Maugham QC, was referred to the CJEU in September by Scotland’s Court of Session. The government’s direct appeal to the UK’s top court came after Lord Carloway, Scotland’s most senior judge and Lord President of the Court of Session, refused permission earlier this month. In a short statement, the Supreme Court (Lady Hale, Lord Reed and Lord Hodge) said it had considered submissions from the parties “on paper” and refused permission to appeal in this case. News of the refusal comes just days after Theresa May appointed Stephen Barclay, a former trainee at Wragge & Co legacy firm Lawrence Graham, as Brexit secretary. The Conservative MP for North East Cambridgeshire studied law at the College of Law, now the University of Law, in Chester, before going on to qualify as a solicitor in 1998. Barclay replaced former Linklaters lawyer Dominic Raab, who stepped down last week, claiming May’s deal presented “a very real threat to the integrity of the United Kingdom”. Article 50 will never be revoked. Both Labour and Con policy is to deliver upon the 2016 referendum and leave. Because right now revoking article 50 is better than the awful deal May has ‘negotiated’. This comment has been moderated as it breached Legal Cheek’s comments policy. Jolyon Maugham QC involved in another one of these cases. Wonder who is funding these cases? The fact that “QC” is appended to Jolyon Maugham’s name tells us much of what we need to know about our country’s decline. I for one am as are many normal, right-minded members of the public. Not Amused must be thrilled that Brexit is going so swimmingly. Taking back control! I think Not Amused must be dead. There’s been zero comments from him/her lately. A unilateral revocation of Article 50, if it were permitted, would be the greatest threat to the integrity of Britain, in modern times. The people have spoken and the highest echelons of government must, in accordance with universal democratic norms, deliver on the referendum outcome. If people knew what they now know in the hey-day of the deliberations around the referendum, the outcome would perhaps have been different for or with many. But now that the people know what may or may not transpire, as per the bleak predictions that have been surfacing on public platforms and on opinion pages of our newdpapers, what we frankly need now is damage limitation. No piece of legislation, should be capable of fettering the political and economic integrity of a nation as ours. And every decision, afterall comes with a price. If the price of political and economic freedom is Brexit, so be it. The will of the people must be respected and that indeed is the true spirit of democratic process. Democratic machinery across the world allows for reflections. Perhaps, in a couple of years’ time, we would be singing a different tune and itching to return to the fold. But for now, the people have delivered a verdict. Any manipulation of the people’s will, will be at best setting a bad precedent and at worst equal an incontrovertible denunciation of the democratic principles that this country, has fought so hard for. What a wad of utter f’ing bollox. Are you the product of an illicit tryst twixt Jacob Rees-Twott and that Nix bulb from CA ? An unsurprising result in the specific Court of Sessions context that many accurately predicted. The EU is basically a protection racket. It takes British taxpayers’ money and then funnels it back, selectively, to certain persons and projects in the UK, whose loyalty to the EU is thereafter impliedly “bought”. This also explains why the EU’s supporters are so brittle and dealing with them is like walking on eggshells – literally they look to the EU as their provisioner and any challenge to the EU they experience in a childlike way as a kind of existential threat. There might well be a way out of this stupidity.